The long awaited Scott Hahn commentary on Romans, via the excellent Catholic Commentary on Sacred Scripture series, will be released on November 7th. This is one of the best Catholic biblical series out there because it does an amazing job combining the pastoral and the academic. It utilizes the current NAB NT, which also makes it useful for those doing lectionary-based catechesis or for homiletics in the US. "Scott Hahn has written a masterful commentary on Romans that is theologically insightful and pastorally relevant. While dealing adeptly with the historical and literary background of Romans, he always keeps the focus on its theological content and meaning for our lives. I recommend Hahn's work to all who want to discover the powerful message of Paul's great Letter to the Romans." 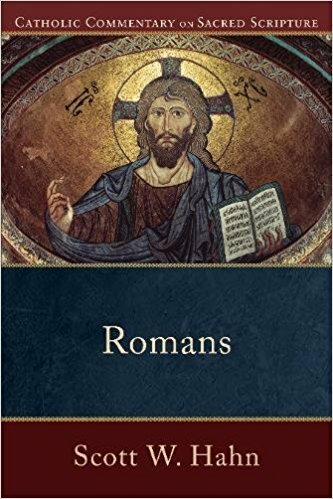 "Hahn's commentary on Romans is lucid, penetrating, theologically alert, and a joy to read. It will be of interest to both scholar and nonscholar alike. His status as one of the most prominent Catholic converts from Protestantism makes his treatment of this great Pauline text, which was of such significance to Luther and the other Reformers, of particular interest." "Hahn has written an informative, elegant, and learned commentary on Romans. The exegesis is crisp, the explanations are clear, and the judgments are consistently sensible. One of the best commentaries available on Romans from within the Catholic tradition. A treat to read and a treasure to hold." "For four decades, Hahn has joyfully studied, debated, preached, taught, and lived Paul's Letter to the Romans. No biblical book is closer to his heart, with the result that the vibrant wisdom of this commentary exceeds that of commentaries many times its size. Judicious in its sifting of the scholarly literature, profound in its handling of sensitive Jewish-Christian themes, and powerful in its proclamation of the gospel, this deeply Catholic commentary will find a notable place among his most enduring and influential books." Scott Hahn is a good guy, but I think I will stick with Origen's Commentary on Romans. I've read some stuff from the Christian East recently that seemed to suggest that the entire Western Christian obsession with the method of an individual's justification is based on Augustine's faulty reading of Romans. It seems that many scholars admit that Augustine misinterpreted some things, but there's a collective shrug of "eh, it's too late to turn the car back." I guess that's the point of the New Perspective on Paul (think NT Wright) as well as some Eastern voices like David Bentley Hart. I think Scott Hahn is familiar with and influenced by the "New Perspective on Paul" movement. Hahn says there are different understands of "works of the law" in Paul. According to Hahn, Augustine understood it to mean the entire law of Moses, ceremonial and moral. Jerome understood it to mean only the ceremonial Jewish laws. Hahn splits the difference by saying that Augustine is correct regarding the initial justification that comes with baptism. An infant hasn't performed any works of the law, ceremonial or moral, but he can still get baptized. Final justification at the Last Judgement however takes place apart from the ceremonial work of the law, but not apart from the moral law. You can argue that Hahn is letting Augustine off the hook, but he does regulate Augustine's interpretation to a fairly minor issue: who can get baptized, not who can get saved. The so-called 'New Perspective on Paul' doesn't assume that St Augustine was wrong in interpreting Paul, but that Martin Luther and the first generation of Protestants were wrong. If Augustine is involved in that at all, and he isn't, it is only because Martin Luther misinterpreted Augustine. The fundamental insight of the 'new perspective' is that the traditional Lutheran and Reformed interpretation of Paul is completely wrong. Those who hold to the 'new perspective' generally criticize Luther and the early Protestants for reading their own disagreements with Rome into Paul. To Catholics, the 'New Perspective' is not new at all, it's just the traditional way of understanding Paul that Catholics have always held to. In short, the 'New Perspective' is essentially a Catholicizing movement within Protestantism, and as such, Catholic scholars have generally looked upon it favorably. I agree that "The New Perspective is basically Protestant scholars admitting the Catholics were right all along on justification" is one way to simplify what the New Perspective is about. In conversation with people I've practically used those exact words. But I still think this was new to us. I am no scholar--I first encountered the New Perspective at a New Testament class I took in fall of 2005 when I was an agnostic college student. We read Gager's "Reinventing Paul" and I may have read some of James Dunn's stuff (but mainly to cherry pick quotes for a paper). Since I've converted I've read a couple things by NT Wright on Paul (but not his really, really big and really, really expensive "Paul and the Faithfulness of God"). I think to reduce the New Perspective to be a point for the Catholics in some Catholic/Protestant contest ignores a lot of what the New Perspective says. It is not as if the New Perspective scholars are banging the doors down to get into the Catholic Church. In fact NT Wright has scoffed at the thought of some that he become Catholic. Reading my initial post back, I do admit I was very confusing. The New Perspective isn't explicitly against Augustine's readings of Romans from his late anti-Pelagian work--although many commentators reckon it as implicitly such. In many ways, though, the New Perspective is still a Western reading of the text. The fact that it is a post-modern reaction does not remove it from its cultural context. As an example, here's one example of an Eastern reaction to all of this. "I think to reduce the New Perspective to be a point for the Catholics in some Catholic/Protestant contest ignores a lot of what the New Perspective says." That isn't what I said at all. What I said is that the New Perspective is about some Protestant scholars concluding that Luther and the early Protestants incorrectly interpreting Paul and reading their own dispute with Rome into the New Testament. It's a movement that exists solely among Protestants, Catholics have no role in the movement at all. However, the fact some Protestants are admitting that Protestants have historically gotten Paul all wrong is something that Catholic scholars have generally looked upon very favorably. Those Protestants who have opposed the New Perspective have made the arguments that the New Perspective 'reverses the Reformation', and there is some truth to that accusation. Bob if you have access to it check out the essay on "The Works of the Law" in the Ignatius Catholic Study Bible p. 335. Hahn and Mitch talk about a "new perspective on the works of the law" in Paul by some modern scholars. I'm pretty sure they are talking about the 'New Perspective on Paul'. They go one on to say that this 'new perspective ... is actually a very old one', citing Origen, Jerome, Aquinas and others. They do point out that Augustine has a 'broader interpretation'. As you may know, Hahn was a convinced Calvinist and an accomplished Protestant theologian and scholar before he read himself into the faith. I strongly suspect that the 'New Perspective on Paul' was one of several things that led him to the church. Perhaps someone with more knowledge of Hahn's journey can chime in. He's probably the perfect person to write a commentary on Romans. OK I found the smoking gun. Listen starting at 17:34 to Scott Hahn's conversion story, entitled "Luther in Reverse": https://www.youtube.com/watch?v=XyFuaXlYo8Q. He talks about how, while finishing up his degree at a very Calvinistic seminary, he become involved in the dispute surrounding Norman Shepherd, a divinity professor who got fired for teaching that Sola Fide was wrong and a misinterpretation of Paul. Shepherd is often cited favorably by the 'New Perspective on Paul' movement. Hahn said he become convinced that Shepherd was correct, and that it was a shattering experience for him. He concluded that "St. Paul did not teach what Luther said". Nor Calvin. This was the start of a long journey that led him home to the Catholic faith. I'm looking forward to his commentary on Romans. Forgive me for sending this conversation far afield! And especially forgive me for misrepresenting what you said Biblical Catholic. I'm thinking out loud in a forum that isn't a place for thinking out loud. This is a tough place to have actual conversations--I wish we could share a couple beers in my living room and talk about Paul. 'Cuz Paul is the man. I'll probably get this commentary too. For me at least you didn't take the conversation that far afield. It prodded me to recollect what the author's (Scott Hahn's) background regarding Paul was. I had heard Hahn's story many years ago but forget the details. Now that I have recollected how pivotal Paul and the interpretation of faith and "the works of the law" (a crucial part of Romans) were in Hahn's conversion story, I really want to read his commentary! So thanks for the stimulating conversation! True enough, Luther misinterpreted Paul's Epistle to the Romans, but I would not go so far as to say Luther misinterpreted Augustine. It would be more accurate to say that Luther's heresy was the result of an untempered, unmoderated Augustinianism. I would suggest you all avail yourself of the opportunity to read my friend Thomas P. Scheck's book "Origen and the History of Justification: The Legacy of Origen's Commentary on Romans." Tom also addresses this issue again in the introduction to the Commentary on the 12 Prophets by Jerome, Volume, 2 in the Ancient Christian Texts Series (ACT). Yes, I am mentioned by Tom in the introduction, but it is such an important work of Jerome's that Tom has pushed into print. We should not forget that Father Martin Luther was an O.S.A. (Order of St Augustine, wearing a black habit), a friar and not a monk, who spent much of his novitiate studying Augustine. Because of the trajectory of thought in the Latin Catholic Church in the middle ages, Augustine was preferred over Jerome, who has a view of Romans similar to John Chrysostom. Chromatius also had a "eastern" view of Romans and he was influenced by Jerome and Rufinus, as you will see when Scheck's transition of Chromatius' Tractates and Homilies is published as part of the Ancient Christian Writers series this coming year (ACW #72). While my initial comment was flippant, I found it quite liberating to read Origen's Commentary on Romans that Tom translated into two volumes for the Fathers of the Church Series, FOTC ##103 and 104. Scot Hahn is good, but I find him "small." But the problem I find with him and other contemporary Christian (Catholics, Orthodox and protestants) commentators on scripture is that they do not come across breathing the fire of the Holy Spirit in their works, as I find with Jerome in his Commentary on Isaiah, Didymu the Blinds on Genesis, Origen's homilies on Ezekial, John Chyrsostom on the incomprehensible nature of God, and so on. I digress, but I should thank Carl Henz as he is the one who motivated me with one of his comments. Now all my bible study is done using the ACW, the FOTC, ACT, and some others. Yes, I made the investment, 50 volumes of ACW, 106 of the FOTC Having read Origen's First Principles, I find the fathers of the church's hermeneutic of using scripture to interpret scripture to be the way to go as it opens one up to (pseudo) Dionysian flights and spiritual fire. For example, reading Origen's first sermon on Isaiah, one cannot but help be caught up in the love he has for God and then one can make the connection to Bonaventure's "The Soul's Journey into God" with the fiery seraphim, "six winged and many eyed." Okay, where do I get ACW, ACT, and FOTC? Logos? Mike, the FOTC may be directly ordered from the Catholic University of America Press. Check out their website. The ACW may be directly ordered from Paulist Press. The ACT may be directly ordered from Intervarsity Press. Sometimes certain books from all three presses may be found cheaper at Christian Book.com. If you wish to focus on a specific book, such as Genesis, you have some great options. FOTC 74, 82 & 87 are Chrysostom's homilies on Genesis, translated by the imcomparable late Robert Charles Hill, who also translated the highly recommended Didymus the Blind's Commentary on Genesis (FOTC #132). Read these with Ephrem of Edessa's Commentary on Genesis (FOTC # 91) and Origen 's Homilies on Genesis (FOTC #71) and you will never see/understand/read/ comprehend Genesis in the same way. The Fathers liberated me from my youthful captivity to footnotes in the old NAB. Genesis is now a story of God's fiery love for me and you, not a series of myths and cold academic hypothesises. Thank you, James Ignatius McAuley.